Night of the Living Dead was released on October 19th, 1990. Filming locations include Washington and West Middletown, PA. Very cool. Love this remake, watched it last night for the umpteenth time, was wondering if the house was still around. Yes the house and most of the other structures on the property are still there (the above photos were taken 3 months ago). However, be cautious because the owner of the property, Brian Teagarden doesn't take kindly to Night of the Living Dead fans. Well I don't take too kindly to people with the name teagarden. were any parts of this movie shot in volant pa. ? Not that I'm aware of. There aren't many filming locations for this movie which also make it unlikely. Brian should cash in and have a open day for fans. I was told there was some filming in Amity, PA... anyone know any of the details? extremely old post but George Romero Directed the Stephen King movie the Dark Half. The scene where they bury George Stark was at the Amity Cemetery I heard. From watching the movie I believe this to be true. Watching it now... It's cool to see the then and now pics. That Fan of the Dead is mighty difficult to find! I thought there was some filming in Connellsville Pa?? 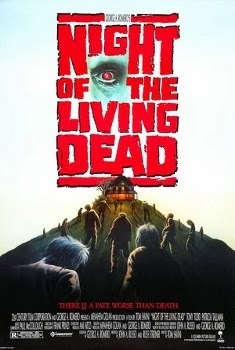 As a Zombie fan since I first saw the original "Night of the living dead" in 1978, I was hooked. I have met several original cast members and became friends with Karl(Harry Cooper) Hardman. I have visited ALL the sites of the original. When the 1990 remake came out, I headed straight to Washington, PA from central Ohio. At the time the house was on the market through Century 21, so luckily nobody was living there at the time. I decided that I needed to take a piece home with me. Not to do any destruction I found a Welcome Mat near the porch and got a picture of myself holding the Mat to prove that this was where I picked this up. When I met Karl Hardman in 1989 he commented that nobody had ever came to Pittsburgh to meet him and always considered me the 1968 Night Of The Living Dead number 1 fan. I was just here this weekend, traveled here from CT. Was a great experience and saw some pretty cool stuff. Didn't go up to the house but drove by and took a bunch of pictures. The barn infront of the house has been updated with new siding .